The African violet is not the only plant that thrives in a fluorescent light garden! I knew of one indoor garden grower who never had less than five hundred flowering plants (and usually more because its owner cannot resist trying something new under the lights) and there isn’t an African violet anywhere! Growing indoors under grow lights a “garden” flourishes year around. It’s immune to seasonal changes, drought, rain, wind or storm. It’s easy to clean, and you can work on it day or night. A complete, portable fluorescent light system can be purchased from any of several manufacturers or you can make your own. Setup consists usually of some type of shelving with two or three tiers with a lighting fixture(s) suspended over each shelf. Some people build units to grow and display plants a the same time in a living room for example. Mine is in the garage, others use areas such as a closet, basement, bookcase, room divider or dedicate a room devoted solely to plants. A good rule to follow when preparing and setting up an artificially lighted growing area is to provide 15 to 20 watts of fluorescent light per square foot of growing area. Always use the longest tubes you can fit into your space, because the light output of any size fluorescent tube falls off appreciably at each end of the tube. If you have, say 100 inches of space lengthwise, use a 96-inch (74-watt) tube instead of two 46-inch (40-watt) tribes end to end. The choice of fixtures lies between the “industrial” fixture and the “strip” fixture, and will depend on your own preference. There is little difference in light output between the two, but the strip fixture is usually less expensive. Be sure your electrical system will carry the added load. A normal house circuit should be able to carry about 1200 watts of fluorescent lights safely, if used for nothing else. A timer-control switch which turns the fights on and off automatically at the same time every day is a good investment, they can be purchased at your local home improvement center or online at Amazon. Buy a good one (ten to 12 dollars) with an Underwriters Approved label. It should have a capacity of at least 1500 watts and be easy to set. Incandescent light is not necessary as a supplement to the fluorescent light, but will do no harm so long as the bulbs are far enough away not to burn the plants. Fluorescent light (generally) will not burn a plant, even when it strikes water on a leaf (not recommended). Almost all of the kinds of fluorescent tubes on the market today will work for plants, and all cost about the same, but some do better than others. Most fluorescent tubes are manufactured for the purpose of enabling people to see, and people use the green and yellow parts of the color spectrum for this purpose. Plants, on the other hand, use the red and blue parts of the spectrum and have little or no use for the yellow and green. The best results are obtained with tubes which contain relatively high quantities of the red and blue parts of the visible color spectrum and low quantities of the yellow and green parts of the spectrum. For an area where display of plants is more important than their culture, the “natural” tubes enhance the color of both flowers and foliage and make a dramatic display. Of course there are available fluorescent grow light tubes developed specifically for growing plants, called “Gro Lux Lights”. It contains the red and blue colors which plants can utilize, and casts a lavender glow. They give the impression they are enjoying good health. Other phases of good culture (humidity, temperature, ventilation and fertilizing) should be followed when growing with artificial light, according to the demands of the plants being grown. Growing indoors under fluorescent lights you can choose from an almost limitless number of plants that will do well. The plants described below will flower with 15 to 16 hours of light every 24 hours, in a temperature range of 62 degrees at night to 75 degrees in the daytime, with a relative humidity of from 40 to 60 per cent. Many of them will do well with less than these ideal conditions. Plants must have a period of darkness in every 24 hours, and you cannot do them a favor by letting the lights burn around the clock. 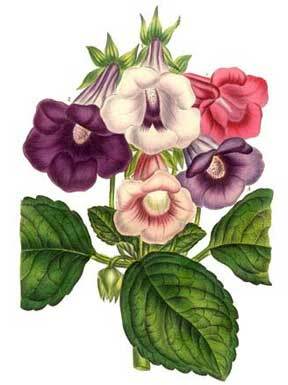 Gloxinias – They need more light than African violets. They should be placed three to four inches below the tubes when small, the distance being increased gradually until the top of the mature plant is about eight inches below the tubes. Episcias – Require less light than African violets, and do best when placed at least ten inches below the tubes, at the ends of the tubes where the light is less efficient than it is in the middle. The light enhances the beautiful foliage colors, and promotes flowering. The growing tips of episcias will brown and wither if the plant receives too much light. Columneas – need the short days of fall to initiate buds, to produce their magnificent orange flowers under fluorescent light. The best are the trailers, grown in pots or baskets. The tops of these plants should be six to eight inches below the tubes. There are many other gesneriads which flower under lights if given good culture, including aeschynanthus, kohleria, smithiantha and streptocarpus. 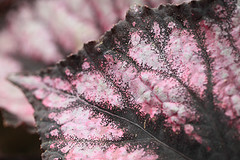 Begonias – Almost all look their best in a fluorescent light garden, the exception being some of the rhizomatous kinds which need fall’s short days to flower, but even they luxuriate tinder lights when grown as foliage plants. Many of the begonias which show a semi-dormancy when grown under available natural light in the winter do not observe any dormancy under fluorescent light. Almost any angel-wing begonia will flower continuously under lights. In the rhizomatous group Begonia masoniana (known as ‘Iron Cross’) is spectacular with its emerald-green, nubby leaves each centered with a chocolate-colored replica of the German iron cross. The foliage of rex begonias is more colorful and dramatic under artificial fights than it is in a greenhouse, outdoors or on a window sill. Norfolk Island pine (Araucaria excelsa) has formal, tiered branches of bright green needles, the lighter-green growing tips lending a fringed appearance. It grows straight and true, four to six inches a year, about ten inches below the tubes. Use it as a living Christmas tree on the table. 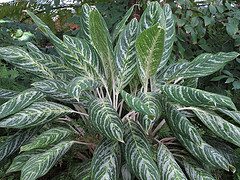 Chinese evergreen Chinese evergreen (Aglaonema modestum) is usually grown as a foliage plant. Placed about 14 inches below the tubes, mine has flowered (calla-type flower) and set clusters of seed pods which have been on for almost a year and are not yet ripe. One delightful, seemingly ever-blooming, plant which can be started from seed is Exacum affine, a member of the gentian family, a bushy little jewel with loads of blue, star-like fragrant flowers with deep yellow stamens. The plant stay under four inches tall, and flowers profusely when grown six inches below the tubes. Cacti, especially when started from seed or purchased when very small, will make you gasp with astonishment the morning you discover a brilliant flower three times as big as the plant. Many other succulents will flower under lights, too. They like to be close to the tubes, as little as one inch below. Coleus reaction to fluorescent lights – vivid colors not seen in outdoor culture. Seeds can be started and plants brought to maturity at any time of the year when you garden indoors with fluorescent lights. The lights can be used as a flower factory, where plants can be grown to perfection for display in other parts of the home, and returned to the lights when they start to deteriorate. Fixtures can be hug under greenhouse benches, practically doubling growing space. A word of warning is in order: Like salted peanuts, you can’t stop with just one fluorescent-light garden. You’ll soon be appraising the possibilities of converting closets, cupboards and the guest room to gardens!